Whats wrong with this picture? The rear brake shoe adjuster plug is missing. Previously I had written about the importance of replacing that little plastic cap for your valve stem if found missing. Another important component to have in place is the little oval shaped rubber plug that goes in your backing plates for your rear brakes. What purpose do these plugs serve? If you have rear brake shoes on your car they may need to be adjusted manually from time to time because the brake shoe self adjusters do not always work as they should. You may have a service done that includes a brake adjustment,and that little oval rubber plug will need to be removed to gain access to the self adjuster with a tool. The problem here is when the plug is not re installed after the adjustment is made dirt and moisture enters the brake drum it can cause large grooves to be worn into the brake shoes and drums. Also that self adjuster that we were just talking about seize up and will not move over time. As a result of this you might notice a low or spongy feeling brake pedal, poor parking brake performance, or a grinding type noise from your rear brakes. 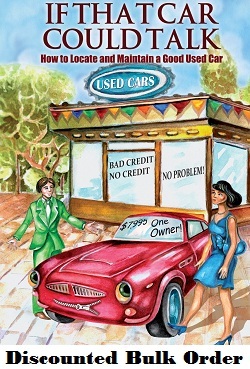 Make sure if you have your rear brakes serviced, adjusted or replaced make sure the adjuster plugs are re installed. 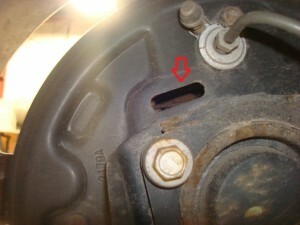 Green arrow points to installed brake adjuster plug. 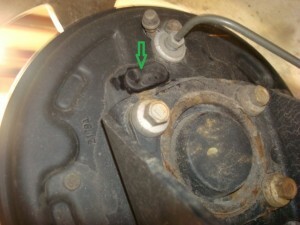 « Maintenance Question: Mike R. asks , “Whats the safest way to clean my battery” ?